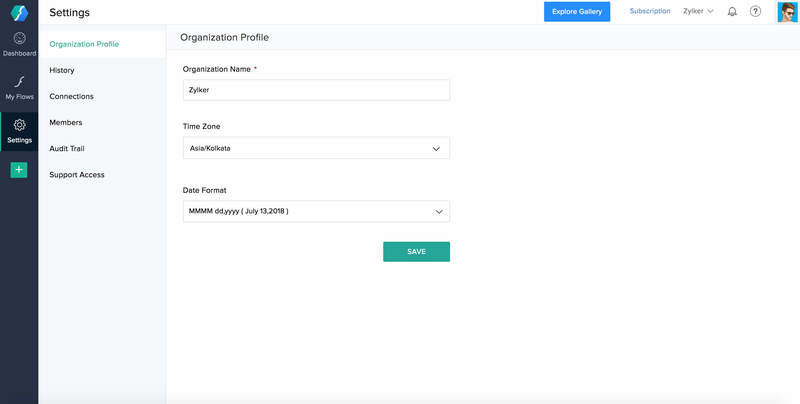 The Settings section lets you view and manage organization details, app connections, and members on Zoho Flow. To access Settings, click the gear icon on the left bar. Under the organization profile you can view and edit various details such as the organization name, time zone, and date format. Note that the organization name can be edited by the owner or admins only. The time zone of your organization is taken into consideration when you configure a schedule trigger or include a delay in your flows. The flow will execute based on your organization's time zone. If you are part of multiple organizations, you can switch to another organization by clicking the organization name on the top bar. Access Organization: Click to access an organization that you are a part of. Set as Default: When you set an organization as default, you will be directed to it every time you access Zoho Flow. Leave Organization: If you request to leave an organization, an email will be sent to the owner. Once they approve your exit request, you will no longer be able to access the organization. The connections and flows that you created will continue to be active. Delete Organization: Hover on the organization name and click the trash icon that appears to delete the organization you own. If you choose to delete the organization, a request will be sent to the Zoho Flow Team. You can cancel the request before approval, or reactivate the organization within 30 days of deletion. View the history of all flow executions in your organization here. Click a particular execution to see all the steps of the flow and their input and output details. 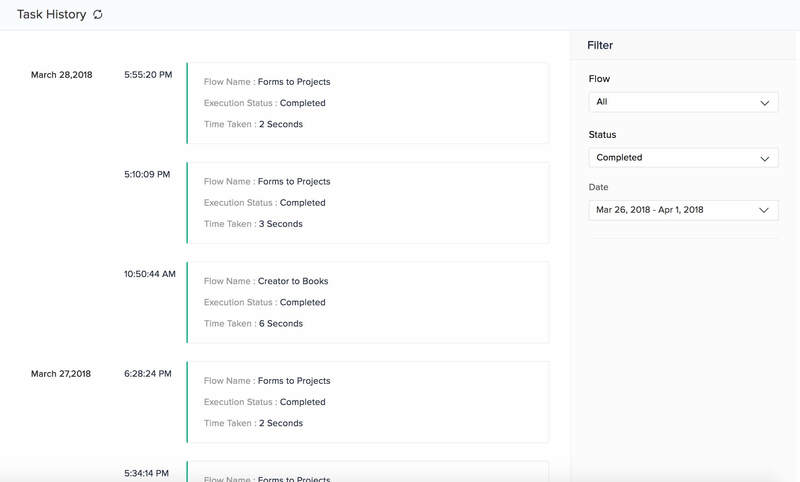 The filters on the right allow you to view a customized list of executions sorted by flows, status, and date. A connection is an app account that Zoho Flow has permission to exchange data with. For example, you can connect your Trello account or your team's Gmail account to Zoho Flow. In the configuration window that appears, choose an app and click Next. You can edit your connection name any time by clicking the edit icon. Enter any other details required to create a connection. This varies by app as different apps have different authentication requirements. For some apps, you may be able to choose whether the connection can be used for all triggers and actions or only for a selected few. Note: You can create multiple connections for the same app. 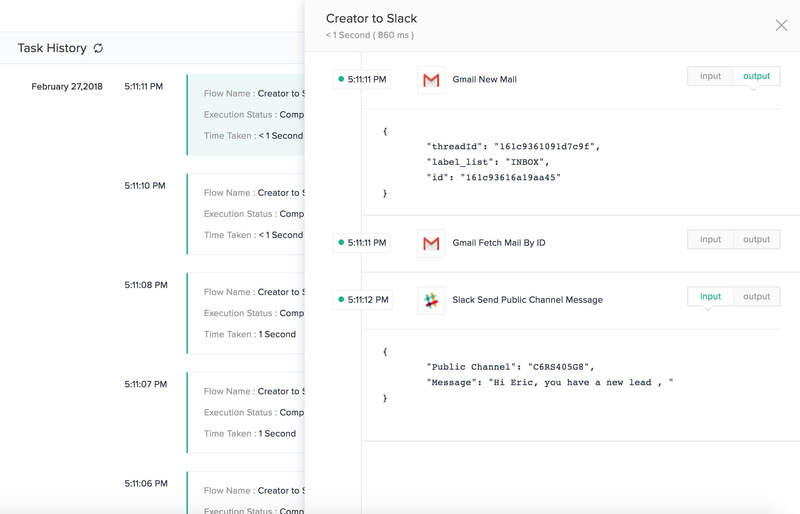 For example, you can connect your personal and professional Gmail accounts to Zoho Flow. Your app connection is private by default. Sharing a connection makes it available to all members of your organization. They can access, create, and update data by using the connection in flows. Click Share to share the connection with your organization members. Unsharing a connection denies all other users access and makes it private again. Flows using the connection will continue to access, create, and update data using the connection. Click Unshare to make the connection private. An invalid connection causes your flow to fail. Click Test to check whether your connection is working correctly. If you do not see a success message, try reconnecting or creating a new connection. Reconnect if your connection has an issue or if you want to change the triggers and actions that can use this flow (for selected apps only). Click Reconnect, make the necessary changes, and click Authorize. Deleting a connection removes it permanently. If you delete a connection, flows using it will fail. Actions previously executed by the flow with the connection won't be affected. Click the delete icon for the connection you want to remove from your organization. There are three types of organization members in Zoho Flow: owners, admins, and users. You can create an organization and belong to multiple organizations. The owner or admin can manage the members of the organization. Click Add Member in the top right. Enter the name, email address, and role of the new member and click Send to invite them. You will be notified by email when the member accepts your invitation. To change the role of a member, click on the current role. Choose the new role from the dropdown. View the list of confirmed or pending members by choosing one of these options from the dropdown. Deactivating a member restricts them from accessing your Zoho Flow organization. Select the checkbox for the required user and click Deactivate. To activate the member again, select the checkbox for the user and click Activate. Removing a member denies them access to your organization until they are invited again. 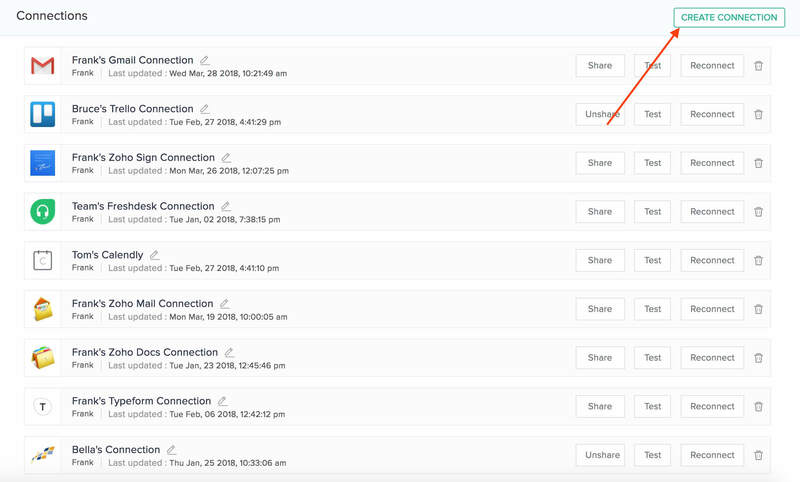 This feature is particularly useful when you want to invite a client or an employee from another team to work in your Zoho Flow organization for a limited period of time. To remove a member or an invitee, hover over their name until the trash icon appears in the upper right corner. Click it to remove them permanently. Alternatively, select the checkbox for the user and click Delete. The audit trail is an organization-wide log of activities. Use it to track what is happening in your Flow organization. To view activities for a specific period only, use the filter option on the right. Note: This subsection will only be visible to the owner and admins of the organization. 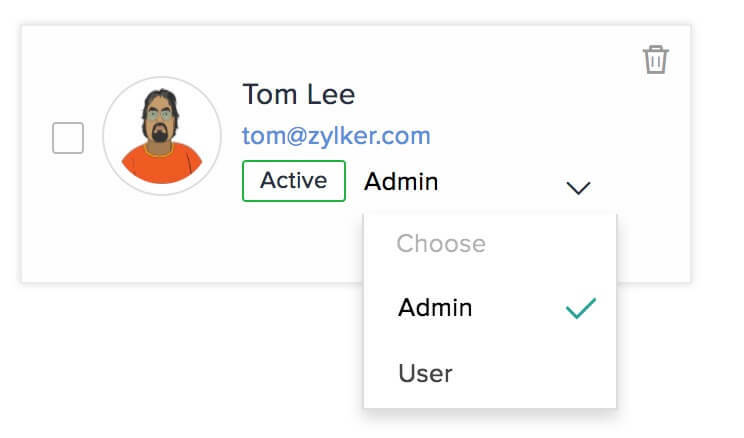 Enabling support access allows the Zoho Flow team to use your connections to edit and debug your flows. 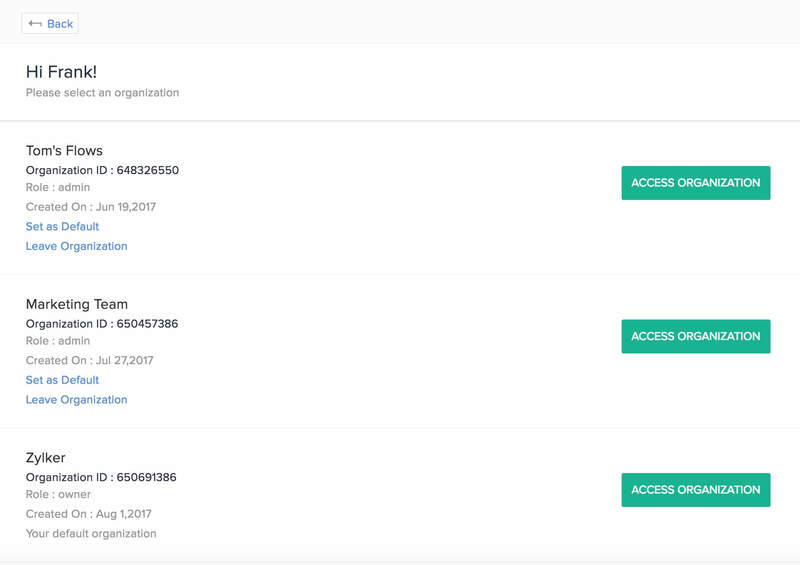 Click the checkbox next to Allow support access to grant the Zoho Flow team access to the connections in your organization.